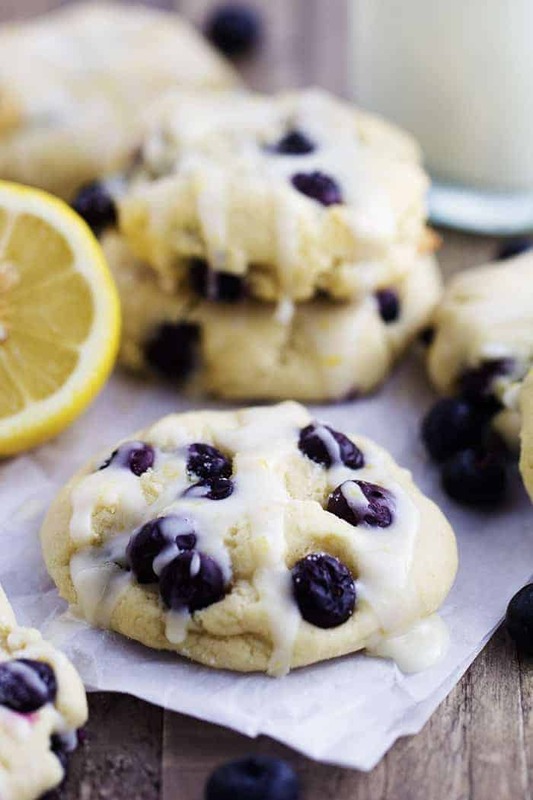 Perfect moist and puffy cookies with fresh blueberries bursting inside. 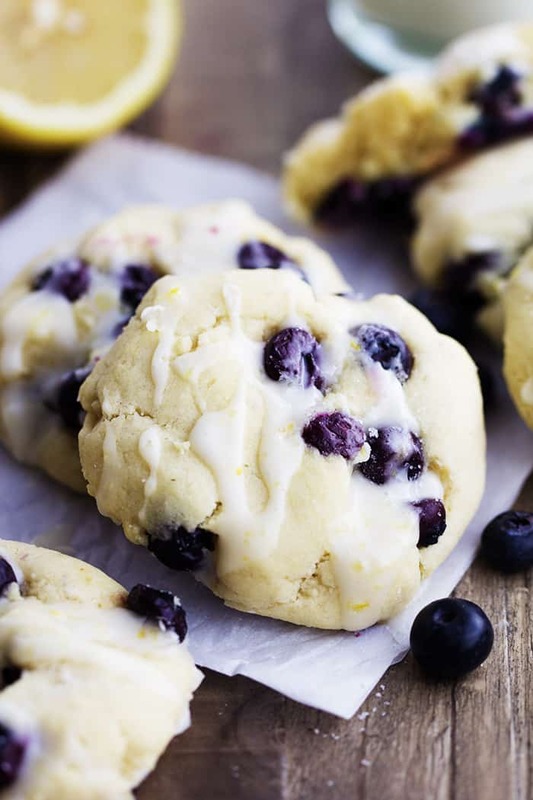 These cookies are a mix between a blueberry muffin and a soft and chewy cookie. Drizzled in a lemon glaze, these will become a new favorite! I am celebrating a pretty special occasion today with some of my favorite blog friends. Our friend over at Something Swanky is having a boy! So we are throwing her a virtual baby shower to celebrate. I wanted to bring some delicious cookies and these Blueberry Cream Cheese Cookies are perfect! I was so excited to hear that Ashton is having a boy. Having two boys, I feel like I am a pro in the boy department. They are so much fun! I had to learn how to hunt for bugs, go to monster truck shows, and break a nail or two digging in the dirt. Boys are so sweet and and I can’t wait to meet Ashton’s little bundle! As I was thinking about what to make for Ashton, I thought blue. And then it involved into something ‘blue’berry. And blueberry just happens to be perfect for this time of year. But have you ever had a blueberry in a cookie?! Whoa. like whoa. These tasted like a blueberry muffin and a cookie had a baby. Ha. The cookie base was perfection. Soft, puffy, and chewy and the cream cheese inside was awesome. 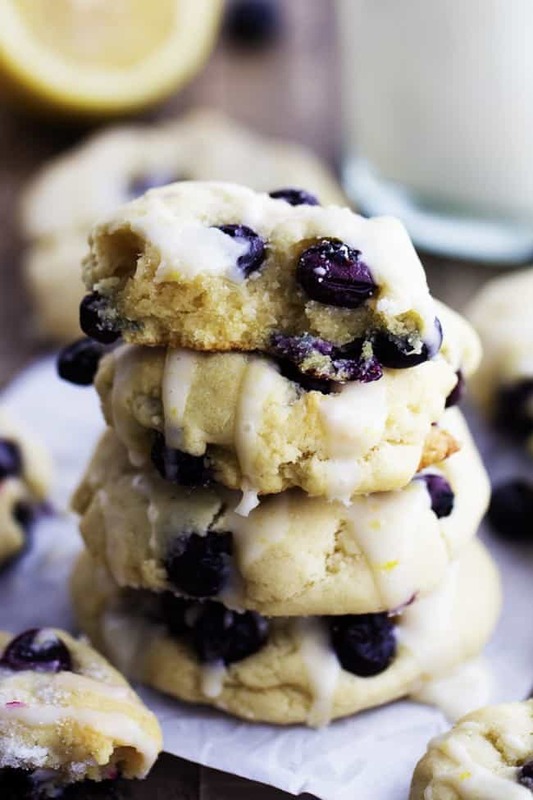 The blueberries just burst inside your mouth with every bite and kept the cookies moist and soft. I couldn’t stop eating them they were so good. But the added lemon glaze on top was the perfect finishing touch to these cookies. Lemon and blueberry go so well together and the hint of lemon was so refreshing. These cookies are soft and chewy and absolutely perfect. I know that you are going to love them too! Preheat oven to 350 degrees. Line a cookie sheet with parchment paper or lightly spray with cooking spray. In a large bowl cream together the sugar, butter, and cream cheese until smooth. Add in egg and vanilla and beat until incorporated. In another medium bowl combine flour, baking soda, baking powder, and salt. Beat the dry ingredients into the wet ingredients until incorporated. Gently fold in blueberries. Drop heaping tablespoons of dough onto the cookie sheet. Bake for 10-12 minutes. Let cool on a wire rack. TO make the glaze, whisk together the powdered sugar, lemon juice, milk, vanilla and lemon zest. Drizzle on top of cookies. These look absolutely melt-in-your-mouth delicious!! Brilliance!!! And thank you so much for being a part of this shower, you guys are way too sweet! And I will definitely be hitting you up for boy-parenting advice– I still can’t believe it’s a boy! YIKES! Awwww I always love seeing virtual baby showers! Such a sweet idea! And these cookies… I wish I had one right now, they look amazing! You have totally convinced me to try cheesecake cookies! These look perfect! I love the addition of cream cheese- yum! I can’t wait to try them. Alyssa – these are AWESOME. I love cream cheese cookies, great idea to add blueberries! Such pretty vibrant colors, what a great classic flavor combo for these fun cookies. Cookies meet muffin – that means I can have them for breakfast, right? 😉 These look amazing, Alyssa! What a fabulous sounding cookie! I love that you said these were like a muffin and a cookie had a baby! Sounds like my kind of cookie! Must add blueberries to cookies stat!!! These look great. Thanks for the recipe. Will be on the lookout for blueberries at the Farmer’s Market tomorrow. I just made these yesterday and although they are very yummy, they did not turn out very pretty… nothing like the pictures. I used fresh blueberries and as soon as I folded in the blueberries the dough started to turn purple. Thankfully the lemon glaze helped make them more attractive. What did you do to avoid purple cookies? Made these for our block party and they were a hit! Next time I think I will add either lemon zest or lemon juice to the cookie batter to bring out more of the lemon. Also, I used fresh blueberries and found them to be a bit challenging as they didn’t quite stick to the dough a burst a few times in my hand. Might go with frozen ones and see how that works next time. I can’t wait to try this recipe. My husband LOVES blueberries & will eat anything with blueberries in it. We have a blueberry farm not far from our summer place. If you’ve never gone to pick them before, you’re missing a whole lot of fun. Not to mention how reasonable they are. You don’t even have to wash them to freeze for future use. Just put them in zip lock bags. Looks really tasty and easy to make. Thanks for sharing. This recipe has way too much flour and too many blueberries. Then simply do not make this recipe and move on to one where the ingredients look acceptable to you. Why post negatively? Your comment was neither helpful nor necessary. This recipe has too much flour and way too many blueberries. I agree with Mindy, way too many blueberries and flour. Dough so stiff no way to *gently* fold in blueberries. I didn’t use all of the dry mixture and still had problems. These cookies are amazing. I haven’t tried them with the glaze yet because I am out of powdered sugar. They are like a muffin cookie combo. Mmmmmm. They are challenging to make. The dough is very stiff, even though I cut the flour by 1/4 cup. I also used 1 1/2 cup of frozen blueberries instead of two. I gave up trying to fold in berries and instead dropped dough on the pan and pushed blueberries around it. Pain but totally worth it because they are good! I guess I should have read the reviews first. Agree with the comments saying way too much flour and berries. There is no way author could have folded the berries into the play-doh consistency batter. I ended up pushing the berries into the dropped dough before baking. This recipe will not be saved. When I made my glaze it was very thick and I had to add an extra tablespoon of lemon juice and milk to thin it out. What did I do wrong? The recipe looks like it’s 1 1/2 cups powdered sugar but is it supposed to be just 1/2 cup? Just made these cookies. I didn’t have lemons for the glaze so instead I added 2 cups of white chocolate chips. SO GOOD! This recipe is a keeper. The family looks at me with a side glance when I mention the word “bake” (that’s not a positive). Ending up in the freezer right from the oven was a wonderful thing to wake up to in the morning. I made these cookies and they were great. I tried them three times because I was also having trouble incorporating the blueberries into the thick batter. When I mixed the blueberries in by hand, they turned out perfect. Hope that helps. Well done Alyssa! These cookies are simply outstanding Alyssa! What a fantastic recipe to have in my portfolio. I will definitely give it a try and I am really thankful to you for sharing it! I have made these twice in the last week, one for a family reunion and for a work gathering. They are so simple to make and delish, I also added a smidge more milk and lemon juice to the icing to thin it out. I didn’t have any problem folding in the berries, but I used a good wooden spoon instead of a standard plastic spatula. These are very tasty but the dough is too stiff to fold anything into least of all blueberries. I made these with frozen blueberries and they still broke apart during folding and made the batter purple. Great taste, not so pretty as your picture. I converted it to a Low Carb Low Sugar recipe using Coconut Flour, Swerve and Coconut Milk and it turned out pretty good ? I substituted Cacao Nibs in a few and they turned out good too! I loved these! I had blueberries in the fridge that I didn’t want to go bad and was searching for a cookie recipe and glad I found this! I have a question though…. how do you store them so they don’t get soggy? I put the leftovers ( I know how could that be ? Hahha) in a cake storage container and they were soggy the next day and I was so sad. Made these cookies. They are dangerous! Meaning, had a hard time not eating them! How tasty. Brought some to work and three days later my co-workers want to know when I am going to make them again. Wonder if you could make them with strawberries. Hmmm. The first time I made these I used frozen blueberries. The cookies turned a lovely purple-blue-green color (kind of moldy looking LOL). I followed a tip that said if you thoroughly rinse & dry the frozen berries it will prevent them from bleeding into your cookies….it didn’t work! lol The dough was very thick & made it really hard to mix in the berries without crushing them some. They didn’t look very pretty but were really tasty & got eaten quickly. The second time I made them I used FRESH blueberries……HUGE difference! I also added in a 1/4 cup of applesauce to thin the batter out some which made it much easier to fold in the berries without them getting mashed. This batch came out great! Nice pretty cookies like in the photo & they taste great, too.